There have been two major stories in the IHC-News of late, a mega-Facebook thread that has raised the issue of PUFA in baby formulas, a minor altercation between moi and Matt Stone on Facebook about a study on "autistic rats", and quite a few conversations on this blog involving PUFA of late that has prompted this post. It is a prelude to at least two posts on the issue to come: (1) The Pete Evans / Paleo Way / WAPF-inspired / Nora Gedgaudas defended liver-based baby formula controversy, and (2) Tim Noakes' recommendations of "LCHF" for babies. Mammals are a distinct type of animal -- we all share the commonality of feeding our young via milk produced in the mammary glands of the female -- a practice that extends "in the wild" for varying time periods both between and within the various species. At some point, however, the developing mini-mammal must be weaned onto foods that eventually resemble the adult diet of said mammal, and there is also a transitional period wherein the breastmilk-food ratio goes from food as supplement to breastmilk as supplement. In his Perfect Health Diet book, Paul Jaminet makes the case that breast milk macros offer clues to macro consumption. I wrote about this here. In the book, Jaminet claims that the milk of all mammals has roughly the same macronutrient composition. Clearly from the graphic below, this is grossly in error. Not only is composition highly variable, but as I've arranged my graphic, composition is highly varied even within animals of comparable adult diet types. All mammals consume animal protein and fat in the first part of their lives. Many will mature to be obligate herbivores. Looking for clues to an optimal adult diet from breastmilk composition, seems rather more ridiculous the longer one ponders the idea. But you know what the composition of breastmilk is ideal for determining? It's the perfect diet for feeding an infant. On the species/population level, there can be no food that the body was more perfectly "designed to eat" like that which basic biology provides. When it comes to feeding an infant from a source other than its mother, mimicking breastmilk to the largest possible degree would seem to be a no-brainer here. Human milk also goes through stages and is called colostrum in the first few days, then transitions in the first few weeks to become what is called "mature milk". While some of my tables include the early milks, I'll limit discussion to mature milk only. Let's begin with Human Milk Composition: Nutrients and Bioactive Factors. This is a 2013 review paper that covers so much more than just the macros, but I'll focus on just that in this post and also, I'll just deal with total fat and delve into the nitty gritty of fatty acid profiles later. Excerpts have been bulletpointed for ease of reading. The macronutrient composition of human milk varies within mothers and across lactation but is remarkably conserved across populations despite variations in maternal nutritional status. 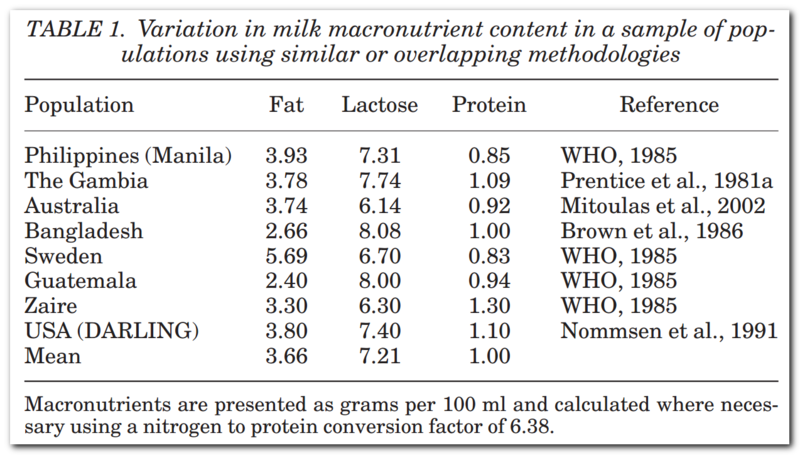 As shown in Table 1, the mean macronutrient composition of mature, term milk is estimated to be approximately 0.9 to 1.2 g/dL for protein, 3.2 to 3.6 g/dL for fat, and 6.7 to 7.8 g/dL for lactose. The average from the Nommsen 1991 were 1.2, 3.6 and 7.4 g/dL for protein, fat and carb respectively. 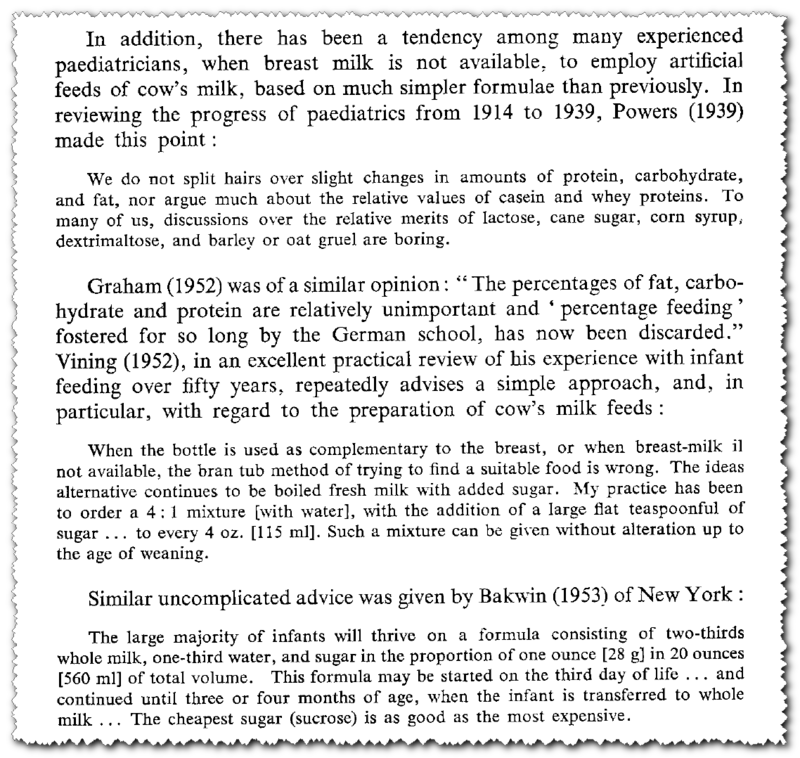 Interestingly, Nommsen demonstrated that this macro composition was quite consistent for milk produced at 3, 6, 9 and 12 months of lactation. Energy estimates range from 65 to 70 kcal/dL, and are highly correlated with the fat content of human milk. 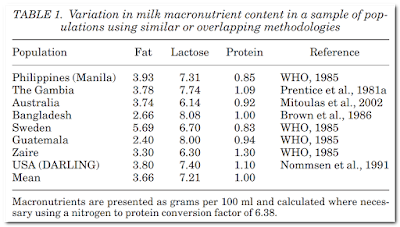 The mean values for macronutrients provided here, while valid, belie the observed variability of individual milk samples, particularly in their fat and protein content. Individual donor milk samples from term mothers range at least from 0.6 to 1.4 g/dL for total protein, 1.8 to 8.9 g/dL for fat, 6.4 to 7.6 for lactose, and 50 to 115 kcal/dL for energy. 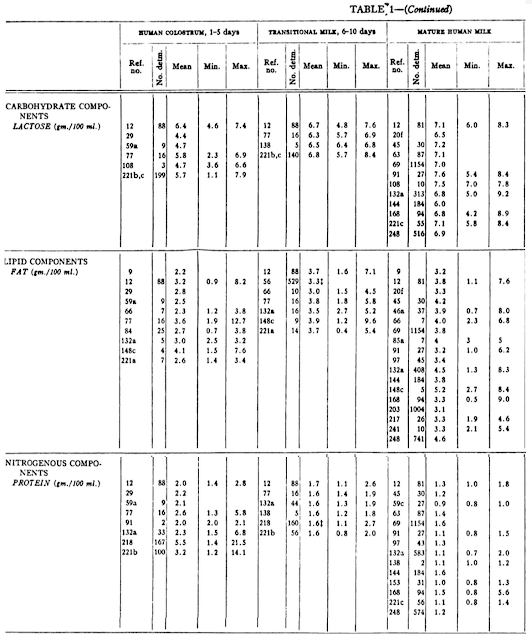 I put the extremes of macros in the table below and used Nommsen as "average"
Here is a table from a 1990 milk bank analysis showing composition percentiles for the macros. 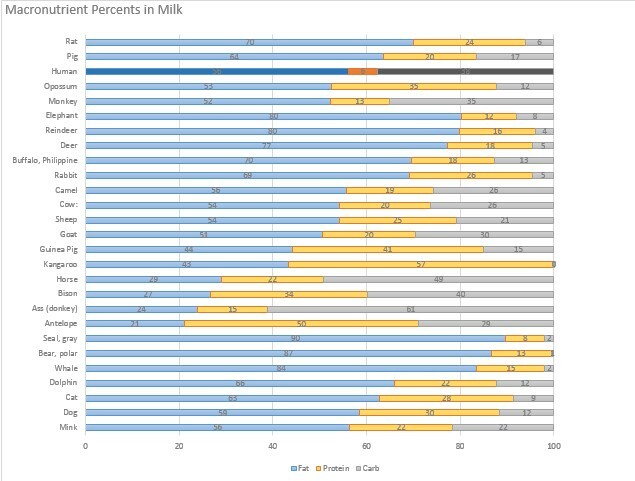 The concentration of lactose in human milk is the least variable of the macronutrients, but higher concentrations of lactose are found in the milk of mothers producing higher quantities of milk. From Predictors of Breast Milk Macronutrient Composition in Filipino Mothers, a nice summary of milk composition around the world is shown below. Another source I found is Macy et. al. 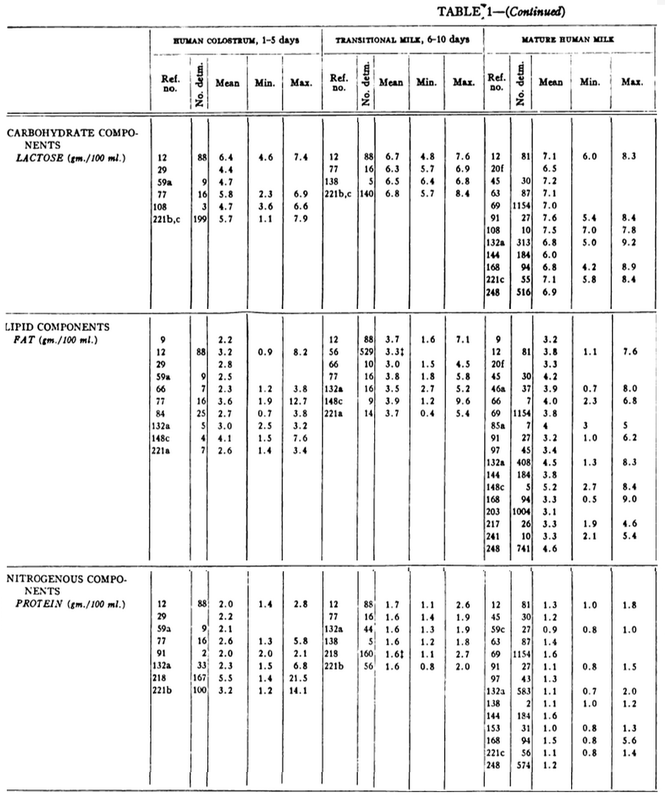 1953 Composition of Milk that compiled numerous studies to that date on the composition of human milk (along with goat and cow). The link is to the digitized book online and you'll find extensive, detailed composition tables. I've crunched down the relavent tables to just carb, fat and protein. I could link you to a half dozen more studies with overlapping compilations of data, but I think you get the gist. Clearly, breast milk is intended to be the sole food source for a baby in at least the early months of life. It contains relatively little protein compared to an adult diet, so while the protein is clearly needed, it could be said that it is of lesser importance at this stage in the game. In adults, higher protein intake generally has a favorable relationship with body weight, and higher protein reducing diets tend to outperform lower protein diets. But this does not seem to translate to the first year or so of life, which I will discuss in more detail in a future post. Fat is the most variable of the macros, and as can be seen in the last table which lists a minimum of 0.5 g/dL and a maximum of 9.0 g/dL!! Again, clearly some fat is essential, and I'll discuss this as well in a future post. But lactose. Carbs. Of the three macros, this is the one that is most consistent, irrespective of the nutritional status of the mother or region of the world (and thus across different races/ethnicities). The Feinmans and Noakeses and other low carb advocates like to repeat the phrase that there is no such thing as an essential dietary carbohydrate. Not one single gram says Tim Noakes! Perhaps this is nominally true for the adult human, but we know that even the "zero carb" folks can't escape the dastardly carbohydrate entirely. It is likely there is far more carbohydrate in the form of glycogen in the native diets of the IHC "poster carnivores" the Inuit. But, yes, we CAN meet our physiological requirement for glucose without ingesting it. But what of baby humans? I'm going to go out on a limb here and say that the composition of human breastmilk gives us a huge clue here. Lactose is a glucose source. Breast milk is almost universally around 7% by weight of lactose. Why? I'd say because dietary carbohydrate is essential to the human infant. Can you argue otherwise? I wasn't going to include this in this post, but this WHO publication came up in a search and includes the following on feeding infants when breastmilk is insufficient or unavailable, etc. I am pretty sure the dilution of the cow's milk is predicated on the relatively high protein content of cow's milk vs. human. You can see above a 2:1 (two thirds milk, one third water) to 4:1 (four-fifths milk, one fifth water) ratio suggested. And then ... sugar! A teaspoon of sugar per 115 ml ... that's about 4 grams sucrose added. The more dilute formula calls for 5 grams per 100 ml by my calculation. And then we also have the Egyptians who apparently were quite ahead of their time with infant nutrition. Soranus specifically mentions boiled honey or a mixture of honey and goat’s milk as the infant’s first supplementary food. Carbs seem to do a baby good! EasyHits4U - Your Free Manual Traffic Exchange - 1:1 Manual Exchange Ratio, Business networking. Get FREE Advertising!